This week’s BEACON Researchers at Work blog post is by MSU graduate student Kurtulus Kok. At least since the appearance of Darwin’s seminal work, biologists have speculated on the sources of biological variation, and many current studies have pointed to the importance of variation in gene expression as a foundational principle. Exactly what changes at a molecular level is a topic of lively interest, with important ramifications for human health. My studies of the Hairy protein, a transcriptional repressor from the fruit fly Drosophila, have revealed new concepts on the consequence of “random” events affecting genomic interactions by transcription factors. These insights prompt us to reconsider mechanisms for the evolution of gene regulatory networks (GRNs). Figure 1. Evolution of cis regulatory interactions through changes in DNA elements. 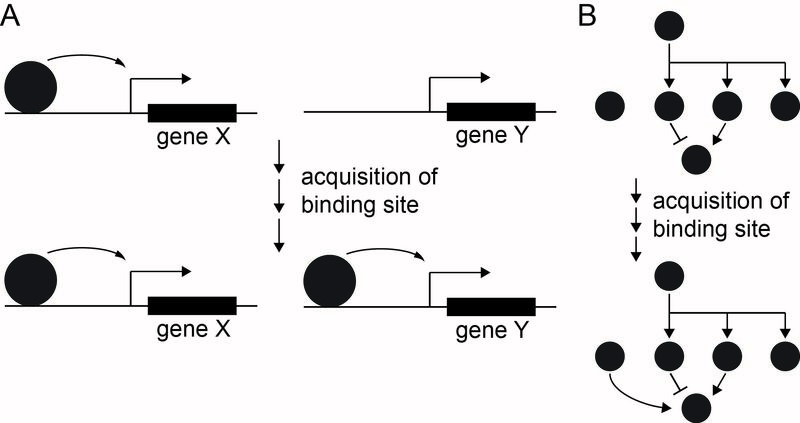 (A) A transcriptional regulator normally regulating gene X may be recruited to an additional target gene Y by acquisition of a new binding site. (B) Interposing a new genetic link by such a modification can reconfigure a gene regulatory network (GRN). One of the most important processes in biology is regulation of precise temporal and spatial use of genetic information to establish the physiological state of multicellular organisms. Proteins called transcription factors (TFs) bind to the genome and regulate the use of genetic information for embryonic development, cellular differentiation and cell fate in response to endogenous and exogenous signals. In other words, what cells are doing, how tissues work, and how organisms survive are dependent on transcriptional regulation. Therefore, understanding the mechanisms in transcription can inform and teach us about what happens when something goes wrong, which may result in diseases. TFs have to regulate gene expression at the right place at the right time (Figure 1A). In eukaryotes, this task is achieved by networks of very complex and combinatorial interactions between DNA binding proteins, co-regulators, and the matrix of DNA and histone proteins termed chromatin. Transcriptional networks represent an important evolutionary target for the development of morphological innovations. 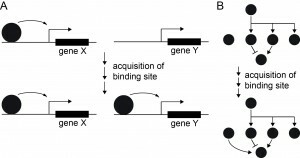 Molecular studies have demonstrated that the acquisition or loss of binding sites on DNA drive significant changes in gene expression that initiate critical evolutionary transitions (Figure 1B). Significantly, although relatively subtle changes have been linked to such important evolutionary innovations, it appears that sometimes gene expression is functionally conserved, even as there are major changes in the structure of transcription control regions. Thus, only some rearrangements of gene control elements alter output enough to meaningfully affect biological processes. Figure 2. Patterning of the early Drosophila embryo is driven by spatially distinct expression patterns of transcriptional activators and repressors, including Hairy, which is expressed in transverse stripes. I am using an excellent model system, the fruit fly Drosophila melanogaster, for the study of transcriptional networks. Since it is subject to easy manipulations, a wide range of genetic and molecular approaches have been applied to characterize regulatory interactions for several decades. Understanding the fly regulatory circuitry will help reveal similar phenomena in other animal systems, since they use closely related genes in conserved genetic pathways. In the Drosophila embryo, localized transcriptional repressors provide essential patterning information that establishes the primary anterior-posterior and dorsal-ventral axes of the organism (Figure 2). The Hairy repressor, a founding member of the Hairy/Enhancer of Split (HES) transcription factors, plays essential and conserved roles in animal development, including segmental gene patterning in the early embryo and specification of neuronal differentiation. Disruption of HES signaling is a prominent aspect of leukemia, lung and prostate cancers. Thus, elucidation of molecular mechanisms of Hairy activity could shed light on a number of important gene circuits that are prominently represented in key developmental pathways. I carried out genome-wide analysis of dynamic transformations in gene expression, chromatin modifications and transcriptional machinery to get insight into direct molecular interactions of Hairy on genome systematically. Figure 3. 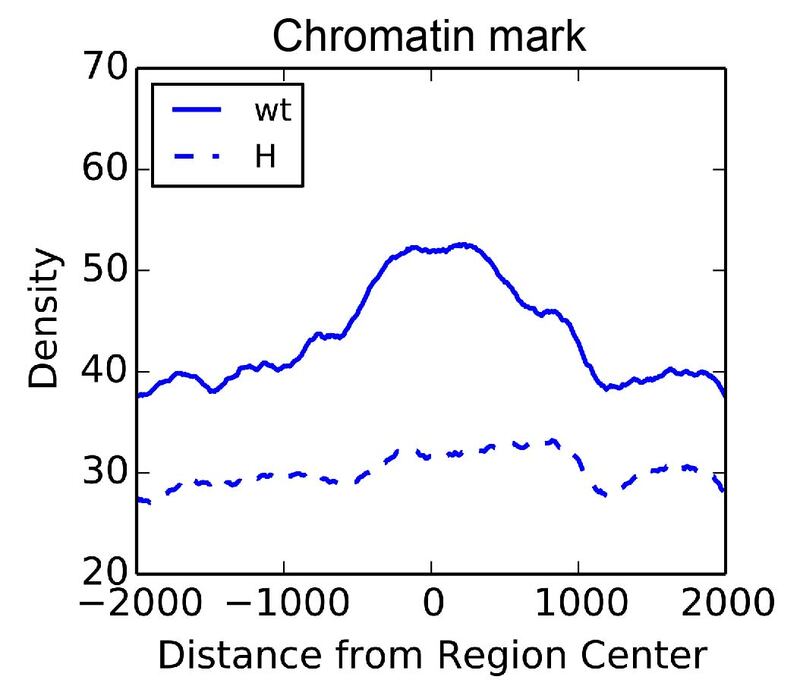 Chromatin marks for an “active” histone modification are lost in large blocks after expression of the Hairy transcriptional repressor. Only a small fraction of these Hairy-mediated events are associated with transcriptional regulation, however. lly with many parts of the genome; some genes are impacted but most are not. This finding let us to propose the so-called “shotgun model” for this apparent off-target activity of TFs on chromatin modifications; many pellets are fired, but few are expected to reach the duck flying overhead. Yet the Hairy molecules that don’t “hit the target” still appear to be quite active, biochemically, inducing chromatin modifications that are similar to those seen on transcriptionally controlled loci. Hairy may be relatively nonselective about where it can attract chromatin modifying agents across the genome. 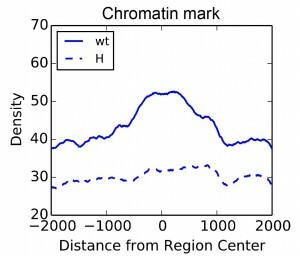 What is the significance of this chromatin modification associated with non-functional binding? For the organism, it is another instance of the extravagance of Nature –all of that chromatin modification for naught! As long as it is not particularly onerous metabolically or genetically, however, it may be the price paid for hitting the duck. “Futile cycling” by Hairy may however provide a unique mechanism for creation of new genetic switch elements; most DNA regulatory modules involve the combined action of transcriptional activators and repressors, thus these off-target sites may provide a path for evolution of novel transcriptional connections through addition of new TF binding sites. Where Hairy is busy acting as if it were shutting down a regulatory circuit by chromatin remodeling, small changes in DNA sequence that draw in existing activators may be sufficient to create a novel genetic switch, and a new connection between nodes in a genetic circuit. Thus modification of core elements of gene expression machinery may be an important answer to the question Darwin raised 150 years ago. How influential this particular mechanism may be will be the focus of future molecular work. For more information about Kurtulus’ work, you can contact him at kokkurtu at msu dot edu. This entry was posted in BEACON Researchers at Work and tagged BEACON Researchers at Work, Biological Evolution, developmental biology, Drosophila, gene networks, gene regulation, transcriptional factors. Bookmark the permalink.